IBM® System i® and IBM System p® platforms unify the value of their servers into a single, powerful lineup of servers based on industry-leading POWER6™ processor technology with support for the IBM AIX®, IBM i (formerly known as i5/OS®), and Linux® operating systems. This new, single portfolio of IBM Power Systems™ servers offers industry-leading technology, continued IBM innovation, and the flexibility to deploy the operating system that your business requires. The Power 570 and Power 595 models announced in April 2008 are fully converged. The Power 520 and Power 550 models announced January 2008 and the April 2008 announcements brought these models very close to complete convergence. The October 2008 announcements and firmware made available November 2008 brought full convergence for the Power 520 and Power 550. 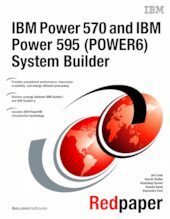 This paper is based upon the current set of IBM Power Systems documentation that is available in various IBM publications and IBM Power Systems Web sites. However, it also provides significant additional information--all in one document. When appropriate, this paper points to these other sources for more detailed or more frequently updated information. -- Mainframe-based continuous reliability, availability, and serviceability. We include MTM chapters that specifically address processor, memory, and I/O features that are supported by that MTM. Then, following these MTM chapters is a large feature descriptions chapter, Chapter 4, "Feature descriptions and related information" on page 187, and various specific topic chapters and appendixes. We also include summaries of AIX and IBM i operating system capabilities and associated licensed program products that are available.